Finally, an all natural alternative to chips that actually taste good! I love potatoes, all kinds, shapes, sizes and preparations of potatoes. If I suddenly woke up and found myself allergic to spuds I don’t know what I would do. I seriously doubt I could survive without some type of potato in my life. I sound a bit melodramatic I know, but I seriously love potatoes. They are my ultimate comfort food. Some people go for mac & cheese, but I would take a big mound of mashers any day. My obsession with potatoes has gone so far as to crush up potato chips and sprinkle them on chocolate ice cream. Don’t knock it until you’ve tried it. It’s the ultimate sweet and salty combo, but I digress. Have you heard about Popchips? I had seen a huge bag at my local Costco, but was not willing to buy a ginormous bag of something I had never even tried before and I would always forget to look for them in the grocery store. Lucky for me they were a key sponsor at Fitbloggin’11. Wow! What a great alternative to your standard potato chip. None of the grease of kettle chips and way more flavor than the baked kind. I sampled the original, sour cream & onion, cheddar potato and sea salt & vinegar. The sea salt & vinegar was my favorite by far. They also offer barbecue, salt & pepper and parmesan garlic. Needless to say I bought the ginormous bag at Costco the last time I shopped. I really can’t wait to try the parmesan garlic variety. Popchips are an all-natural chip. They are not fried or baked. They use a pressure/heat process to “pop” the potatoes. The texture reminds me of Munchos, but the flavor is so much better and they don’t have any of that artificial crap. They are just this great little vehicle for all your favorite toppings. My sister’s family was in a few weeks ago and they were a huge hit. I put them out with cheese slices, salsa, guacamole and onion dip. I really think the sky is the limit for the original/plain flavor. The chip itself is super sturdy so you could lay them out and top them as quick finger snacks at a party. The single serving bags contain about 18 chips and have 100 calories, 3.5 g of fat, no cholesterol, 16g carbs, 1g fiber and 1g of protein. The sodium content varies by flavor but rages from 210mg to 240mg. Each bag is 3 WW+ points. So I’m curious, have you tried Popchips? What’s your favorite flavor and your favorite way to top them? Fine print: Popchips has agreed to send me a free sample case in exchange for writing this blog. That being said, I think you all know me well enough to know that if I didn’t really love them I would not write about them. I was logging my weekly weight on Weight Watchers this morning (3 pound loss…thank you very much!) and I saw they had an article on kiwifruit. Last week I went to Costco and bought way too may kiwis so I am desperate for ideas. I was surprised by the stats. 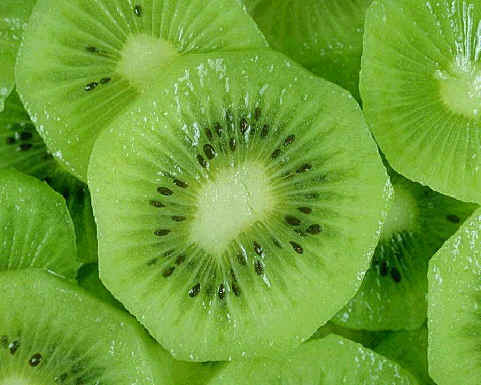 Did you know that kiwifruit only has 56 calories per large fruit and is packed with vitamins C and E and loaded with potassium? I guess I never really thought about it. I was most surprised to learn that the skin, once washed, is edible as well. Personally, I don’t think I’ll ever acquire a taste for the rough fuzzy skin, but good to know. At this point I have so many, I’ve just been adding one to my morning GNC Lean Shake protein smoothie, but I’m excited to try some more adventurous options as well. Weight Watchers has some great ideas so be sure to check them out. I’ve created my own variation from their No Bake Fruit Tart recipe. WW version has 4 points and mine only has 2. I hope you enjoy it and let me know how it goes. Pulverize the graham crackers into a fine crumb and add the apple juice. Find a tin can out of your recycling and clean it really good after removing the top and bottom. Use the can as a mold for the crumb base. Press 1/2 of the crumb mixture into the can and press to compact. Once you have made the base remove the can. I suppose you could add a small amount of whipped cream, but remember that adds calories, fat and POINTS. Enjoy and let me know how you love it! Wordless Wednesday – This was my exercise today. What was yours? When was the last time your dog took you for a walk? Would you take a moment to like my new facebook page? If you do, I’ll write more later. I promise. Three months ago I started to read 52 Weeks of Conscious Contact, a book by Melody Beattie which takes you through daily exercises to help the reader be in the moment and live mindfully. As usual, I lost focus and allowed myself to be distracted by life…so typical. I don’t know why, but I grabbed the book as I was running out of the house yesterday. Three months since I started and I’m only on week 4, but what a good week to pick up where I left off. My weight, eating habits and overall health: I’ve been slacking on all fronts because I keep making excuses. I need to get down to a healthier weight and I need to STOP putting junk into my body. Doing both these will improve my overall health and that is my number one priority. Work/Life Balance: I started a new job last month and I’m still learning my way through a whole new set of rules and standards. I know I can do it and I’m just slightly frustrated because it’s taking me a little longer to get these done. I have to accept that the first six months will probably mean more hours in the office so I have to make the time at home worth every minute. My marriage – I won’t get to personal on this front, but I want everyone to know that I love my husband very much. We’ve been through quite a bit together and are working our way back to trust. I have trust issues in general and I know that if I don’t learn how to trust people, my life will be much more complicated than it needs to be. All the other stuff is background chatter that, quite frankly, just isn’t worth freaking out over. What are your challenges and how do prioritize? I was home for less than 24 hours and then had to take off for Houston, TX today. I don’t mind traveling, but it would be nice to have some home time in between trips. I feel as though my fitness routine and eating habits really suffer when I travel. 1. Be consistent – pick a day or two each week and write. Stick to the schedule as much as possible. 3. If I want to develop a community I have to be part of the community. Respond to reader comments and respond to my fellow bloggers. I have to say, I’ve already followed more advice than I did last year. I created a tumblr account, a flickr account and I registered my domain name. Thank you for being patient with me during the year. I promise to be present this year and I hope you are too! Vicki and I were up bright and early for the New Balance 5k along the harbor followed by a breakfast of Uncle Sam’s whole grains and fresh fruit. How did you start your day? This is a test post. It seems as though I finally figured out how to blog with my iPad. Soooo much lighter than lugging my laptop around. Will I be seeing you in Baltimore this weekend? If so please be sure to say hello. Is anyone else having a problem with time going too fast? It feels like only yesterday when I arrived in Baltimore for Fitbloggin’10. I was extremely nervous and had no idea what to expect, but luckily I had Vicki with me and we conquered our anxiety together. I met so many interesting women and I have no doubt I will meet many more this year. As I left Baltimore last year I vowed to be at my goal weight when I returned in 2011, but that was not meant to be. No worries though. I haven’t given up. I’m still making better choices than I was 2 years ago and that is progress. I haven’t gained any weight back in almost 18 months which is a major accomplishment for me. My entire adult life has been an up and down battle with my weight, but I finally understand that food is fuel and not a reward. I know that if I want to have a beer and a slice of pizza I can, but I can’t make that a daily habit. I joined a gym and have logged at least three days a week in the gym. I hired a personal trainer and have actual muscle definition and strength. I ran my first official 5k in 41 minutes and crossed the home plate finish line at PNC Park . I went on a cruise and wore a swimsuit in public. I even hiked through the rain forest in Belize and went 4 wheeling in Mexico. I may not be at my goal weight YET, but I’m getting there and I’m not letting my weight prevent me from doing things anymore! It looks like it is going to be a beautiful day here in Pittsburgh, PA! What is on your agenda for the day? Me…I am going to get washed & dressed and head outside to try to get some much needed yard work started. This is my favorite day of the month though because it is haircut and color day!!!!! Hooray! So I will spending a good two hours of it inside this afternoon, but it’s worth it! I’m also going to try my hand at a long outdoor walk/run after the salon! I can’t waste this weather. Be well and if it’s nice where you are….get outside and soak up that vitamin D.